This Singaporean recipe takes on a delicious twist with the use of Knorr Barbecue Sauce. It will lend itself well for both the Buffet as well as a la carte menus! Heat the groundnut oil in a wok, and when hot, stir-fry the ginger, chillies, mushrooms and turmeric for a few seconds. Cook for less than 1 minute. Add the red bell pepper, carrots, and bean sprouts and cook for another minute, then add the cooked chicken, and stir well to combine. 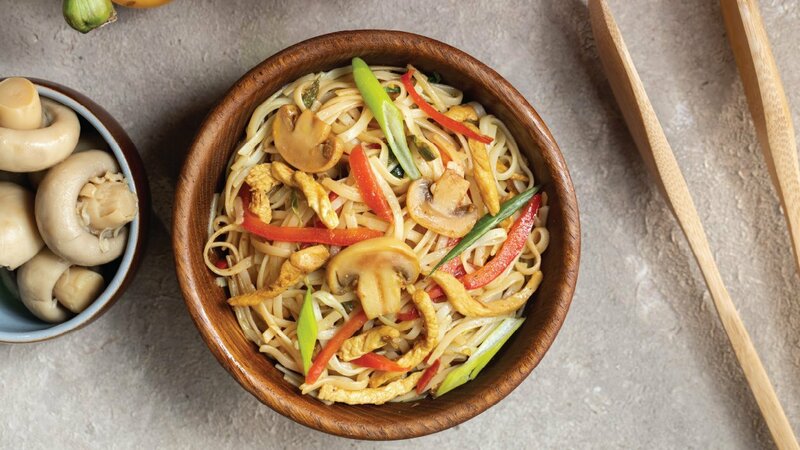 Add the noodles, and stir-fry well, for 2 minutes, then season with the chillies, Knorr Chicken Stock Cube, soy sauce, Knorr Barbecue Sauce, oyster sauce and vinegar. Stir to combine. Add in the beaten egg, stirring gently until the egg is cooked through, less than 1 minute. Then, season with sesame oil. Sprinkle over the spring onions, and serve immediately.